Today is the birthday of Daisy Ann Peterkin (1884-1952). Originally from St. Louis, as a youth she was interested in the modern dancing of Ruth St. Denis and Isadora Duncan, and went to Europe to study dance. She made her professional debut at age 19 in France billed as “Le Domino Rouge”, costumed entirely in red and wearing a red mask. In 1905 she came over to the United States with this act. Within months, she had met and married Mark Luescher, manager of Klaw and Erlanger’s New Amsterdam. Luescher became Peterkin’s manager and made her over as “Mlle. Dazie”. Though the two divorced in 1910, this is the billing and persona she would retain for the balance of her professional career. Mlle. Dazie was an immediate sensation. 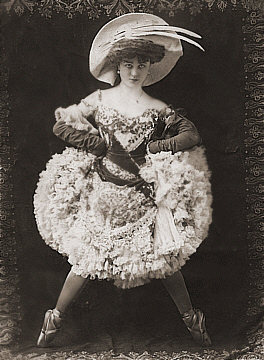 From 1906 at least through 1917 she was a staple of big time vaudeville, often headlining at the Palace. She was also featured in the first two editions of the Ziegfeld Follies in 1907 and 1908, and appeared in a half dozen other Broadway shows. Her last was Aphrodite (1919-1920). Her eclectic routines mixed elements of ballet and toe dancing, pantomime, eccentric dance, and she was one of the first in America to ignite the Salome craze. In 1920 she retired to settle down with her husband, businessman Cornelius Fellowes. To find out more about vaudeville past and present and performers like Mademoiselle Dazie, consult No Applause, Just Throw Money: The Book That Made Vaudeville Famous, available at Amazon, Barnes and Noble, and wherever nutty books are sold.